The Allan Cup was donated by Sir H. Montague Allan, C.V.O. shortly after the Stanley Cup became the championship trophy of the professional hockey clubs. While the Stanley Cup originated as an amateur trophy, the proceeds from the Cup games went to the competing teams. This led to abuses of the principles of amateurism as clubs gathered star players from all parts of the country, regardless of cost, knowing that if they got into a Stanley Cup series their share of the receipts would take care of the extra expenses in building up a championship team. As a result Mr. Northey prevailed upon Sir Montague to offer a trophy for the encouragement of the amateurs, and to safeguard it with such rules and regulations as to prevent it from ever becoming a menace to the sport it was designed to foster. It was decided to make the cup a challenge trophy open to any senior club having won the championship of its league that year. The surplus proceeds after paying the legitimate expenses of the competing teams to be given to charity. Interest in the Allan Cup became greater each year until the challenges became so numerous that it was impossible for any team holding the Cup to defend it against all those clubs sending in challenges. The Canadian Hockey Association was formed in 1914 with branches in the Provinces of Quebec, Ontario, Manitoba, Saskatchewan, Alberta, and British Columbia. The "Allan Cup" was accepted by the association as the trophy emblematic of the senior amateur hockey championship of Canada. 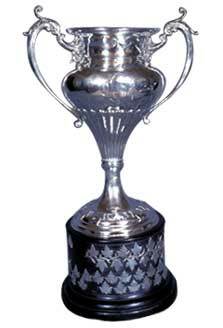 In 1984, the classification of teams competing for the Allan Cup was changed to Senior AAA.